Background and aims: Angiogenesis is a novel component in inflammatory bowel disease (IBD) pathogenesis. We have previously shown that immune–nonimmune interactions through the CD40–CD40-ligand (CD40L) pathway might sustain gut inflammation, although their effect on regulating inflammation-driven angiogenesis is unknown. The present study evaluated the role of the CD40–CD40L interaction in the promotion of immune-mediated angiogenesis in IBD. Methods: Human nonimmune cells of colonic origin—namely, human intestinal fibroblasts (HIFs) and human intestinal microvascular endothelial cells (HIMECs)—were activated with either soluble CD40L (sCD40L), or CD40+ D1.1 cells or CD40L-activated lamina propria T (LPT) cells before measuring pro-angiogenic cytokine release. 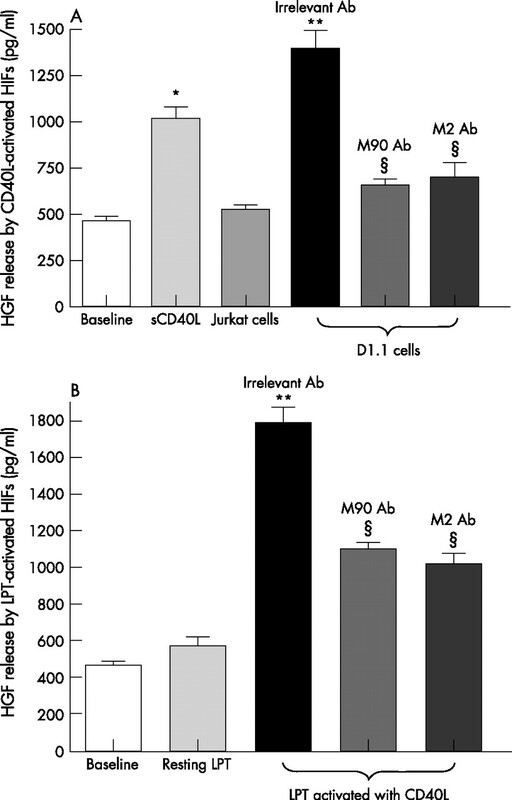 Blocking antibodies to either CD40 or CD40L were used to disrupt the CD40–CD40L interaction. The dextran sodium sulphate (DSS) model of experimental colitis in CD40 and CD40L knockout mice was established to assess whether the CD40–CD40L pathway was implicated in controlling inflammation-driven angiogenesis in vivo. Results: Engagement of CD40 on HIFs promoted the release of vascular endothelial growth factor (VEGF), interleukin-8 (IL-8) and hepatocyte growth factor (HGF). LPT cells were potent inducers of pro-angiogenic cytokine secretion by HIFs. Supernatants from sCD40L-activated HIFs induced migration of HIMECs and tubule formation, both of which were inhibited by blocking antibodies to either VEGF, IL-8 or HGF. Both CD40- and CD40L-deficient mice were protected from DSS-induced colitis and displayed a significant impairment of gut inflammation-driven angiogenesis, as assessed by microvascular density. Conclusions: The CD40–CD40L pathway appears to be crucially involved in regulating inflammation-driven angiogenesis, suggesting that strategies aimed at blocking CD40–CD40L interactions might be beneficial in acute and chronic intestinal injury. Lymphocytes and monocytes might mediate inflammatory-driven angiogenesis, which plays a key pathogenic role in several chronic inflammatory diseases, including rheumatoid arthritis, psoriasis and IBD.8 In such disorders, leukocytes sustain inflammation by producing pro-angiogenic factors and stimulating angiogenesis.9,10 We have previously shown that inflammation-driven angiogenesis actively occurs in both Crohn’s disease (CD) and ulcerative colitis (UC), being directly correlated with leukocyte infiltrate. Although many of the pathways that trigger inflammatory angiogenesis are unknown at present, the CD40–CD40-ligand (CD40L) system crucially mediates leukocyte–endothelial interactions in the inflamed intestine.11,12 In particular, both molecules are highly upregulated in IBD, and are functional in the inflamed mucosa by triggering inflammatory cytokine production, cell-adhesion molecule expression and by fostering mucosal inflammation. To date, the role of the CD40–CD40L pathway in mediating inflammatory angiogenesis in the gut remains to be elucidated. Lymphocytes and monocytes produce pro-angiogenic factors and stimulate angiogenesis during inflammatory responses.9,10 Excessive production of angiogenesis factors by activated T cells and/or activated macrophages might occur in delayed-type hypersensitivity and in chronic inflammatory disorders.13 Interactions between CD40 and CD40L (or CD154) play pluripotent functions in inflammation, predominantly in the effector phase of the immune response.11,14,15 CD40, a 50-kD type-I transmembrane-glycoprotein member of the tumour necrosis factor (TNF) receptor gene family, is expressed by numerous cell types, including professional antigen-presenting cells (APCs), monocytes and ECs.11,16,17 CD40L, a 33-kD type-II membrane-protein member of the TNF family, is predominantly expressed by activated CD4+ T cells and platelets.18 CD40 triggering mediates several biological responses, including immunoglobulin isotype switching in B cells, expression of B7 family molecules on APCs, adhesion-molecule expression by ECs, and expression of cytokines and chemokines that are characteristic of the effector phases of the immune response. CD40 and CD40L are overexpressed in IBD, suggesting a possible involvement of the CD40–CD40L pathway in disease pathogenesis.11 Previously, we demonstrated that the CD40–CD40L pathway amplifies intestinal inflammation and links activated CD40L-expressing T cells with nonimmune cells that, in turn, upregulate cell-adhesion molecules and secrete soluble mediators that recruit T cells, thus sustaining a cycle of immune–nonimmune interactions.12 Accordingly, disruption of the CD40–CD40L pathway by antibodies to CD40L might favourably affect disease course, as suggested by studies in a murine model of hapten-induced colitis and by studies in patients with IBD.22–25 It is demonstrated here that CD40 engagement on human nonimmune cells—namely, human intestinal fibroblasts (HIFs) and HIMECs—translates into the promotion of angiogenesis. Furthermore, we provide evidence that the CD40–CD40L pathway might be involved in the maintenance of inflammation-driven angiogenesis in experimental colitis. Confluent HIFs were either left alone or stimulated with 1 μg/ml of sCD40L, or with irradiated D1.1 cells (CD40L+ acute T-cell leukaemia) or Jurkat cells (CD40− acute T-cell leukaemia; 10:1 ratio of T cells to HIFs) for 24 hours. In other wells, a blocking antibody to CD40L (M90 clone; Immunex, Seattle, WA) was used to hinder the CD40–CD40L interaction.12,27 Trimeric sCD40L and antibodies against CD40 (M2 clone) were provided by Immunex. VEGF, HGF and IL-8 levels in HIF-conditioned medium were measured in triplicate with commercially available ELISAs, following the manufacturer’s instructions. The limits of detection were as follows: <9 pg/ml VEGF, 3.5 pg/ml IL-8 and <40 pg/ml HGF. Chemotaxis was assessed as previously detailed.28 Briefly, fluorescence-blocked polycarbonate filters (8 μm pore size; BD Biosciences, Palo Alto, CA) were coated with human fibronectin (10 μg/ml) for 1 hour at room temperature. By using a transwell system, 35 × 104 HIMECs were plated in the upper chamber in MCDB-131 medium (Sigma Aldrich), whereas the lower chamber contained chemotaxis buffer with phorbol myristate acetate (10 ng/ml), basic FGF (bFGF; 50 ng/ml) or VEGF (50 ng/ml) as positive controls or 1 ml of supernatants from sCD40L-activated HIFs. In selected wells, 25 μg/l of blocking antibodies to VEGF, IL-8 or HGF (R&D Systems) or control antibodies were added to the chemotaxis buffer. After 4 hours, buffer was removed from both chambers, and HIMECs migrated onto the lower surface of the porous membrane were washed twice in phosphate-buffered saline and stained with calcein for 15 min at 37 °C. Duplicates of migrated cells were observed with an inverted fluorescence microscope and counted in six random high-power fields. Quantitative analysis of data was performed by using the Ima Pro Plus software (Media Cybernetics, Silver Spring, MD) connected to an Optronics Color digital camera (Olympus Corporation, Tokyo, Japan). Immunostaining was performed as previously described.28 Briefly, paraffin-embedded intestinal sections were cut at 3 μm thickness, deparaffinized then hydrated, blocked for endogenous peroxidase using 3% H2O2/H2O, and subsequently subjected to microwave epitope enhancement using a target retrieval solution (Dako, Carpenteria, CA) at pH 10.0. Incubation with anti-CD31 antibodies (Dako) was performed at 1:200 dilution for 30 min at room temperature. Detection was achieved with a standard streptavidin-biotin system (Dako), and antigen localization was visualized with 3′-3-diamino benzidene (Sigma Aldrich). Computerized morphometric analysis was performed using an international consensus method for quantification of angiogenesis.29 Briefly, stained colonic sections were scanned at low power to detect the most vascularized area, after which at least five microphotographs of the mucosa at high magnification were taken, defined as the area above the muscularis mucosae (ie, the lamina propria), as well as the submucosa, defined as the area between the muscularis mucosae and muscularis propria. The number of vessels/field (vascular density) was obtained with an Optronics Color digital camera (Olympus). Quantitative analysis of the data was performed with the Image Pro Plus system (Media Cybernetics). EC tube formation was assessed using Matrigel™, a solubilised extracellular basement membrane matrix extracted from the Engelbreth-Holm-Swarm mouse sarcoma, as detailed elsewhere.6 Briefly, multi-well dishes were coated with 250 μl of complete medium containing 5 mg/ml Matrigel™, and HIMECs resuspended in complete growth medium were seeded at a density of 5 × 104. Cells were cultured on Matrigel™ for 16 hours and inverted phase-contrast microscopy was used to assess formation of endothelial tube-like structures. Five high-power fields per condition were examined and experiments were performed in duplicate. CD40 knockout (CD40KO) and CD40L knockout (CD40LKO) mice were kindly provided by Mario P. Colombo (Immunotherapy and Gene Therapy Unit, Istituto Nazionale Tumori, Milan, Italy).30 For the dextran sodium sulphate (DSS) model of colitis, acute inflammation was induced by administration of 3% DSS (40 kDa molecular mass; ICN Biomedicals, Aurora, OH) in filter-purified drinking water for 8 days (Millipore, Bedford, MA). For induction of chronic colitis, mice received three cycles of 5-day 3% DSS followed by 10-day water, as described previously.31 Mice were sacrificed 10 days after completion of the last cycle. Grading of intestinal inflammation was measured in a blinded fashion by three readers: no inflammation (0); modest numbers of infiltrating cells in the LP (1); infiltration of mononuclear cells leading to separation of crypts and mild mucosal hyperplasia (2); massive infiltration with inflammatory cells accompanied by disrupted mucosal architecture, loss of goblet cells, and marked mucosal hyperplasia (3); all of the above plus crypt abscesses or ulceration (4), with a histological score from 0 to 15.32 The disease activity index (DAI) was calculated by scoring 1 point for the appearance of each of the following: ruffled fur, occult foecal blood as determined on a Hemoccult Sensa card (Smith Kline Diagnostics, San Jose, CA), rectal prolapse <1 mm, and soft stool. The mice were scored an additional point for diarrhoea or severe rectal prolapse >1 mm. The approximation of data distribution to normality was preliminarily tested with statistics for kurtosis and symmetry. Results were presented as mean and SD. All comparisons were performed with the Student’s t-test for paired or unpaired determinations or with the analysis of variance, as appropriate. The criterion for statistical significance was defined as p 0⩽.05. In a preliminary set of experiments, we investigated the ability of human CD40-expressing HIFs to release the pro-angiogenic cytokines VEGF, IL-8 and HGF on CD40 triggering. Baseline expression levels and kinetics of CD40 induction in HIFs were extensively described elsewhere.28 Both sCD40L and CD40L+ D1.1 cells induced significant VEGF release by HIFs after 24 hours of culture (fig 1A). Conversely, CD40− Jurkat cells failed to upregulate VEGF production by co-cultured HIFs, and VEGF levels were comparable to those measured in unstimulated cultures. 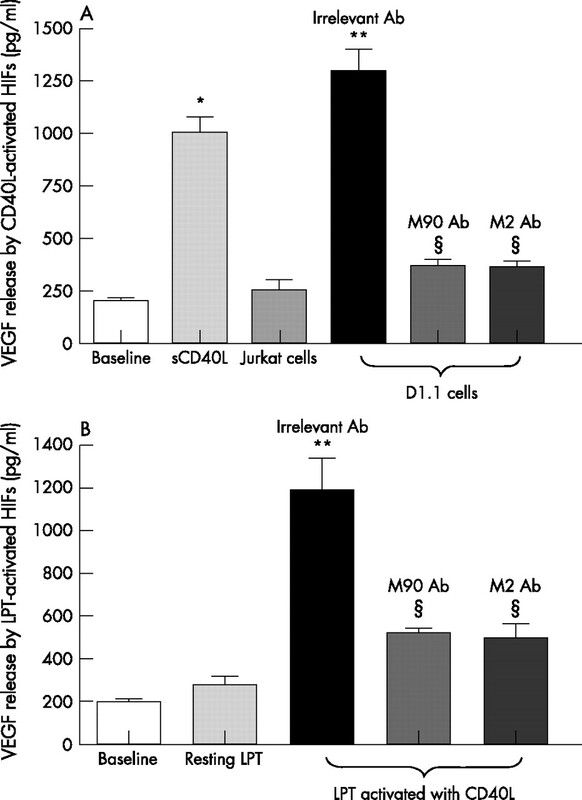 Blocking antibodies to either CD40L (M90) or CD40 (M2) abrogated VEGF production in response to co-culture with CD40L+ D1.1 cells, suggesting the involvement of the CD40–CD40L pathway in the promotion of VEGF release in this system model (fig 1A). Interestingly, activated, CD40L-expressing LPT cells, but not resting LPT cells, from healthy subjects promoted VEGF production by HIFs, a response that was significantly inhibited by the addition of antibodies to CD40L or CD40 to the co-cultures (figure 1B). Control antibodies failed to inhibit VEGF production by HIFs (data not shown). VEGF production by CD40L-stimulated HIFs. Panel A: Human intestinal fibroblasts (HIFs) were activated with soluble CD40 ligand (sCD40L) or were co-cultured either with CD40+ D1.1 cells or with CD40− Jurkat cells for 24 hours, before measuring vascular endothelial growth factor (VEGF) release in culture supernatants. In selected experiments, blocking antibodies (Ab) to either CD40 (M2) or CD40L (M90) were used to interfere with the CD40–CD40L interaction. Results are representative of eight independent experiments performed in duplicate and are expressed as mean and standard deviation. *p<0.01 compared with VEGF release by HIFs not activated with sCD40L; **p<0.001 compared with VEGF release by HIFs cultured in the absence of CD40+ D1.1 cells; §p<0.001 compared with VEGF release in the absence of blocking antibodies to either CD40 or CD40L. Panel B: HIFs were co-cultured either with unstimulated lamina propria T (LPT) cells or with CD40L+-activated LPT cells. In selected experiments, blocking antibodies to either CD40 (M2) or CD40L (M90) were used to interfere with the CD40–CD40L interaction. **p<0.001 compared with VEGF release by HIFs cultured in the absence of CD40+ LPT; §p<0.001 compared with VEGF release in the absence of blocking antibodies to either CD40 or CD40L. As shown in figure 2A, IL-8 production by HIFs also increased in response to sCD40L and, even more so, to CD40L+ D1.1 cells. It must be noted that IL-8 was present in the supernatants of co-cultures established with CD40− Jurkat cells, although at significantly lower levels compared with cultures supplemented with sCD40L (fig 2A). The addition of antibodies to either CD40L or CD40 to the co-cultures of HIF and D1.1 cells translated into a significant reduction of IL-8, the levels of which approached those measured in the presence of CD40− Jurkat cells. Similar results were obtained with activated LPT cells (fig 2B). It should be emphasised that both Jurkat cells (fig 2A) and resting LPT cells (fig 2B) elicited modest IL-8 production, reinforcing the concept that IL-8 production by HIFs appears to be only partly dependent on CD40–CD40L interactions. Finally, sCD40L-stimulated HIFs released significant amounts of HGF and interference with the CD40–CD40L interaction by antibodies specific to either CD40L or CD40 resulted in abrogation of HGF production (fig 3A). 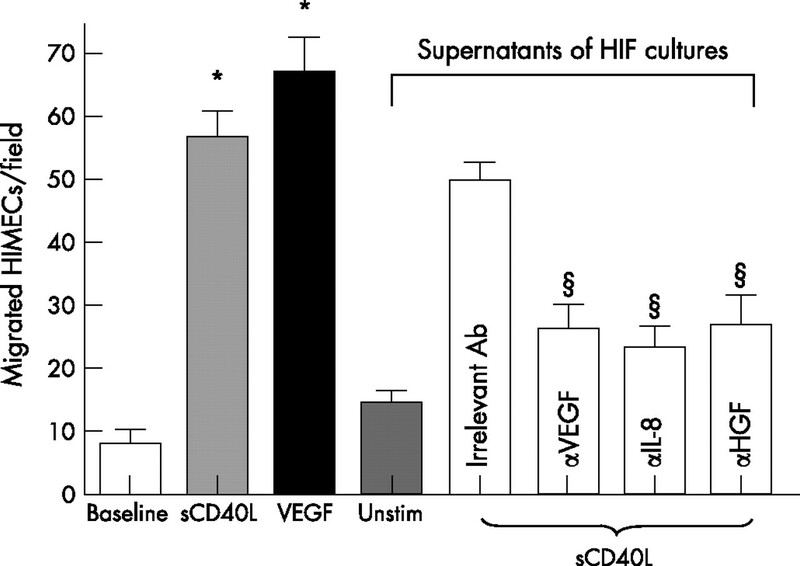 In line with the above results on VEGF and IL-8, activated LPT cells were inducers of HGF release by HIFs, and antibodies to CD40 or CD40L significantly, albeit not completely, inhibited HGF secretion (fig 3B). Unexpectedly, bFGF production by HIFs was unaffected by CD40 engagement (data not shown), indicating that the CD40–CD40L pathway might be involved in controlling the release of a distinctive spectrum of pro-angiogenic factors. Collectively, these results pointed to a crucial role for CD40–CD40L interactions in promoting pro-angiogenic cytokine release. HGF production by CD40L-stimulated HIFs. Panel A: Human intestinal fibroblasts (HIFs) were activated with soluble CD40 ligand (sCD40L) or were co-cultured either with CD40+ D1.1 cells or with CD40− Jurkat cells for 24 hours, before measuring hepatocyte growth factor (HGF) release in culture supernatants. In selected experiments, blocking antibodies to either CD40 (M2) or CD40L (M90) were used to interfere with the CD40–CD40L interaction. Results are representative of eight independent experiments performed in duplicate and are expressed as mean and standard deviation. *p<0.001 compared with HGF release by HIFs not activated with sCD40L; **p<0.001 compared with HGF release by HIFs cultured in the absence of CD40+ D1.1 cells; §p<0.001 compared with HGF release in the absence of blocking antibodies to either CD40 or CD40L. Panel B: HIFs were co-cultured either with unstimulated lamina propria T (LPT) cells or with CD40L+ activated LPT cells. In selected experiments, blocking antibodies to either CD40 (M2) or CD40L (M90) were used to interfere with the CD40–CD40L interaction. **p<0.001 compared with HGF release by HIFs cultured in the absence of CD40+ LPT cells; §p<0.001 compared with HGF release in the absence of blocking antibodies to either CD40 or CD40L. We next asked whether pro-angiogenic cytokine production by HIFs on CD40 engagement was functional and promoted in vitro and in vivo angiogenesis. To this end, we transferred culture supernatants of either resting or sCD40L-activated HIFs onto HIMECs before assessing their migratory behaviour. In control cultures, exogenous VEGF was provided as a cytokine stimulus for optimal HIMEC migration. Soluble CD40L induced migration of HIMECs at levels that were comparable to those measured in response to exogenous VEGF (fig 4). Supernatants of HIFs activated with sCD40L for 24 hours induced significant HIMEC migration, which was in part inhibited by blocking antibodies to either VEGF, IL-8 or HGF, and was completely abrogated by antibodies directed against CD40L (fig 4). 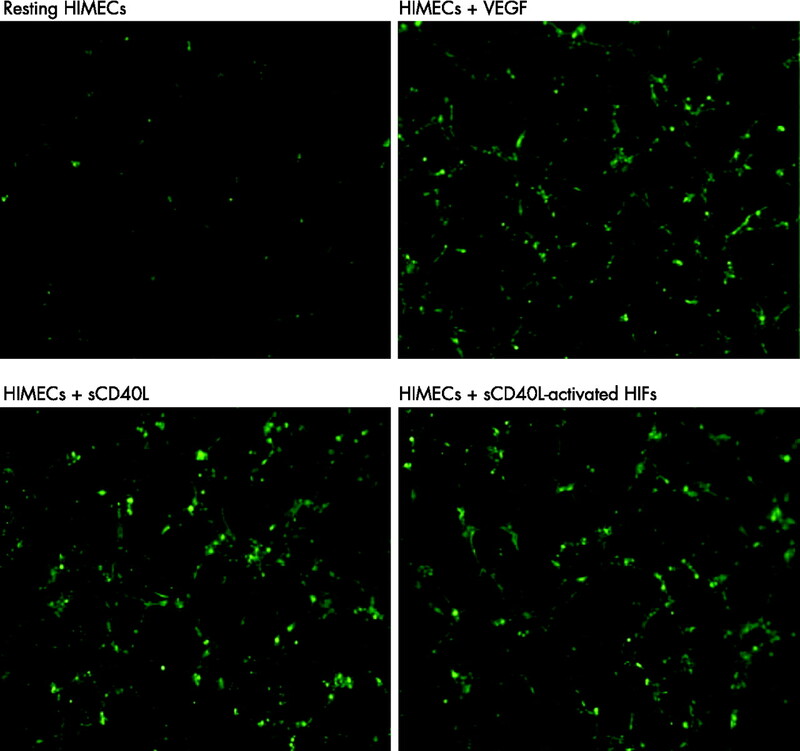 These findings suggest that CD40 engagement is capable of promoting HIMEC migration both directly and through the activation of pro-angiogenic cytokine release by HIFs. This conclusion is further corroborated by in vitro tube formation experiments. As shown in figure 5, either sCD40L (panel C) or supernatants from CD40L-activated HIFs (panel D) promoted the formation of tube-like structures to a degree comparable to that induced by exogenously added VEGF (panel B). The provision of blocking antibodies to CD40L to cultures of HIMECs and supernatants from sCD40L-activated HIFs inhibited tube formation, indicating a pivotal role for sCD40L in the described phenomena (data not shown). Effects of CD40 engagement on HIMEC chemotaxis. Migration of human intestinal microvascular endothelial cells (HIMECs) was measured after activation with either soluble CD40 ligand (sCD40L) or exogenously added vascular endothelial growth factor (VEGF). Additionally, cell migration was assessed after culturing with supernatants from sCD40L-activated human intestinal fibroblasts (HIFs), either in the absence or in the presence of blocking antibodies to VEGF, interleukin-8 (IL-8) or hepatocyte growth factor (HGF). *p<0.001 compared with baseline HIMEC migration. Results are representative of six independent experiments performed in duplicate and are expressed as mean and standard deviation. §p<0.001 compared with cultures performed in the absence of blocking antibodies to VEGF, IL-8 or HGF. Supernatants of CD40L-activated HIF promote in vitro tube formation. Tube formation assays were performed with Matrigel™, as detailed in Materials and Methods. Inverted-phase contrast microscopy was used to assess the formation of endothelia cell (EC)-like tube structures. Either vascular endothelial growth factor (VEGF) or soluble CD40 ligand (sCD40L) were used as positive controls for EC formation. Results are representative of three independent experiments. Five high-power fields per culture condition were examined. Magnification ×40. HIFs, human intestinal fibroblasts; HIMECs, human intestinal microvascular endothelial cells. We next took advantage of the DSS model of experimental colitis to assess whether the CD40–CD40L system might be implicated in controlling colonic inflammation in vivo through effects on angiogenesis. As expected, DSS-treated wild-type (WT) mice developed intestinal inflammation and wasting disease.33 Measurements of both weight loss and DAI clearly indicated that, beginning on day 6 from colitis induction, both CD40KO and CD40LKO mice were significantly protected from DSS-induced colitis compared with the control group of WT mice (fig 6). These findings were underpinned by the histological evaluation and grading of inflammation-induced tissue damage. As shown in figure 7, colonic tissue sections from CD40KO and CD40LKO mice displayed a diminished infiltration with inflammatory cells, and this translated into a lower histological score compared with WT mice. In addition, studies of microvascular density and tissue staining with antibodies to CD31, a well-recognised EC marker, provided objective evidence of diminished angiogenesis in both CD40KO and CD40LKO mice (fig 8). These findings were also confirmed in the chronic model of DSS-induced colitis. 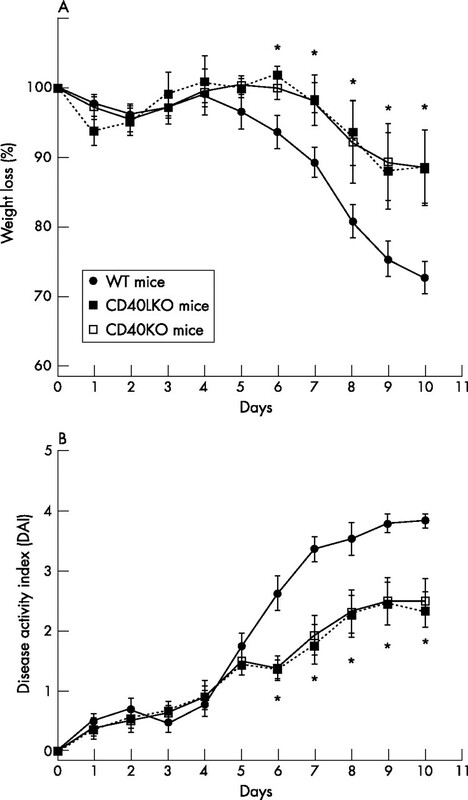 As shown in figure 9, microvascular density was significantly lower in colonic tissue sections of either CD40KO or CD40LKO mice compared with their WT counterpart. 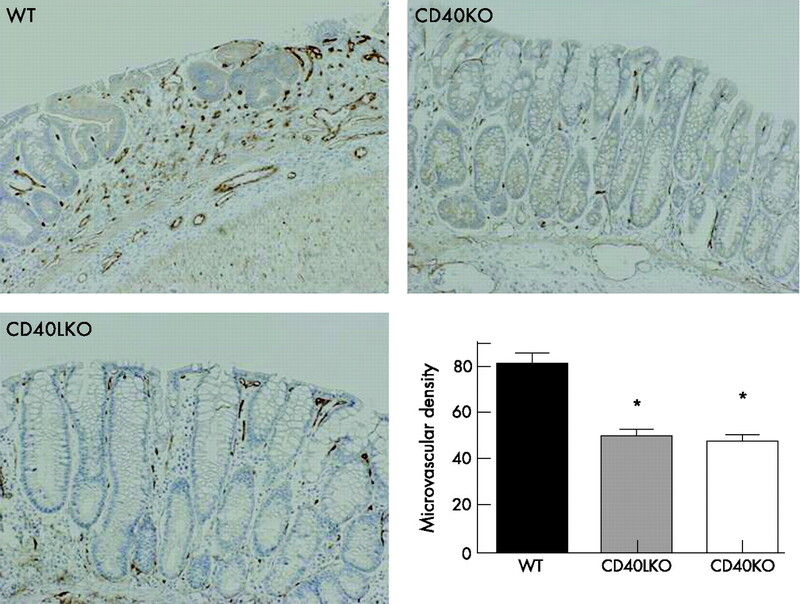 Protection from DSS-induced colitis in CD40KO and CD40LKO mice. Experimental colitis was induced with dextran sodium sulphate (DSS) in either wild-type (WT) mice or CD40 knockout (CD40KO) or CD40L knockout (CD40LKO) mice, in accordance with previously published protocols.33 The percentage of weight loss (panel A) and disease activity index (DAI; panel B) were monitored as indicators of disease severity. Results are representative of independent experiments (eight animals per group) and are expressed as mean and standard deviation. *p<0.01 when comparing either CD40KO or CD40LKO mice with their WT counterpart. 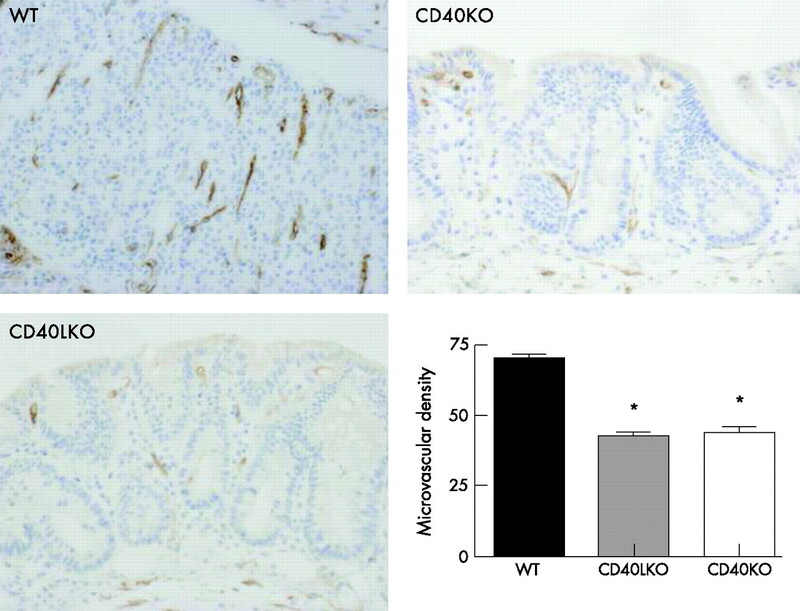 Protection from histological inflammation after colitis induction in CD40KO and CD40LKO mice. Colonic sections were established from either wild-type (WT) or CD40 knockout (CD40KO) or CD40L knockout (CD40LKO) mice, after development of dextran sodium sulphate (DSS)-induced colitis. Histological damage scores were measured as detailed in Materials and Methods. Results are representative of independent experiments (eight animals per group) and are expressed as mean and standard deviation. *p<0.01 when comparing either CD40KO or CD40LKO mice with their WT counterpart. Magnification ×10. Reduction of inflammatory angiogenesis after acute colitis induction in CD40KO and CD40LKO mice. Colonic sections were established from either wild-type (WT) or CD40 knockout (CD40KO) or CD40L knockout (CD40LKO) mice, after development of acute dextran sodium sulphate (DSS)-induced colitis. Microvessel density was used as an indicator of angiogenesis. *p<0.01 when comparing either CD40KO or CD40LKO mice with their WT counterpart. Magnification ×10. Reduction of inflammatory angiogenesis after chronic colitis induction in CD40KO and CD40LKO mice. Colonic sections were established from either wild-type (WT) or CD40 knockout (CD40KO) or CD40L knockout (CD40LKO) mice, after development of chronic dextran sodium sulphate (DSS)-induced colitis.31 Microvessel density was used as an indicator of angiogenesis. *p<0.01 when comparing either CD40KO (n = 8) or CD40LKO (n = 7) mice with their WT counterpart (n = 7). Magnification ×10. Mechanistically, CD40 occupancy on cells of nonimmune origin, such as HIFs, induced pro-angiogenic factor release, which was significantly reduced by neutralizing antibodies directed against either CD40L or CD40. Furthermore, supernatants of HIF cultures were capable of transferring the angiogenesis-inducing activity of CD40-stimulated HIFs, suggesting that cytokine production by HIFs has functional consequences. Blocking antibodies to either VEGF, IL-8 or HGF significantly inhibited HIMEC migration in response to HIF supernatants, unravelling a potential role for these prototypical angiogenic factors in inflammation-driven angiogenic responses. Thus, these experiments point out that the CD40–CD40L pathway can regulate angiogenesis by different mechanisms. First, ECs might be activated by CD40 triggering and this could be the case in CD and UC, in which the elevated levels of sCD40L could induce HIMEC angiogenic activity.8,18 The second indirect mechanism might include the stimulation of angiogenic cytokine production by CD40-expressing HIFs, with subsequent activation of HIMECs. Tube-formation experiments substantiated these findings by demonstrating the appearance of tube-like structures after culture of HIMECs in the presence of supernatants from CD40-activated HIFs. In a final set of experiments, we took advantage of CD40KO and CD40LKO mice to explore the role, if any, of the CD40–CD40L pathway in promoting inflammation-induced angiogenesis in vivo. Serial determinations of DAI in CD40KO/CD40LKO mice indicated a significant protection from DSS-induced acute and chronic colonic inflammation when compared with WT animals. 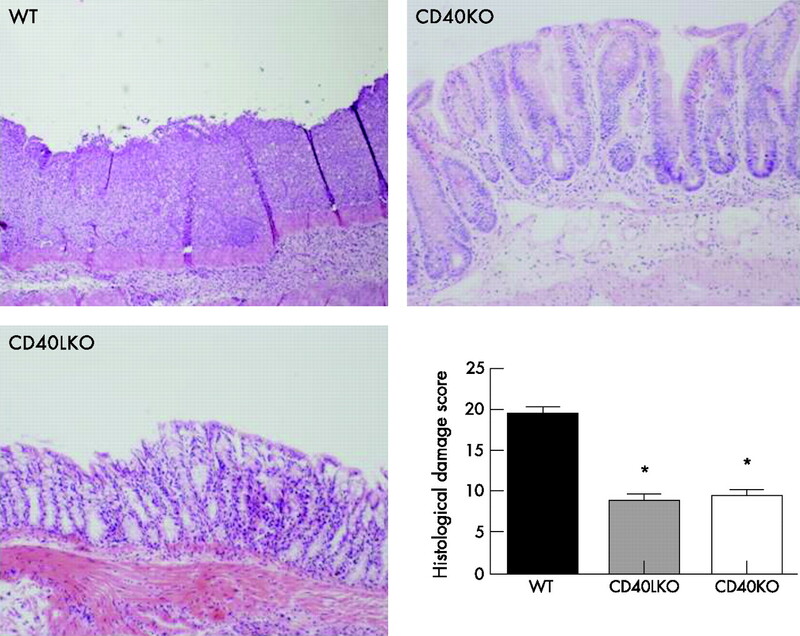 Improved intestinal histology and reduced microvascular density in sections of inflamed colons from CD40KO/CD40LKO mice further strengthened the role of CD40–CD40L interactions in inflammation-driven angiogenesis in this IBD experimental model. In summary, these findings support the notion that immune–nonimmune interactions are important for the maintenance and propagation of inflammation-induced mucosal angiogenesis. We suggest that the modulation of the CD40–CD40L pathway deserves further attention as a future target for therapies to inhibit nonimmune cell-dependent angiogenesis. 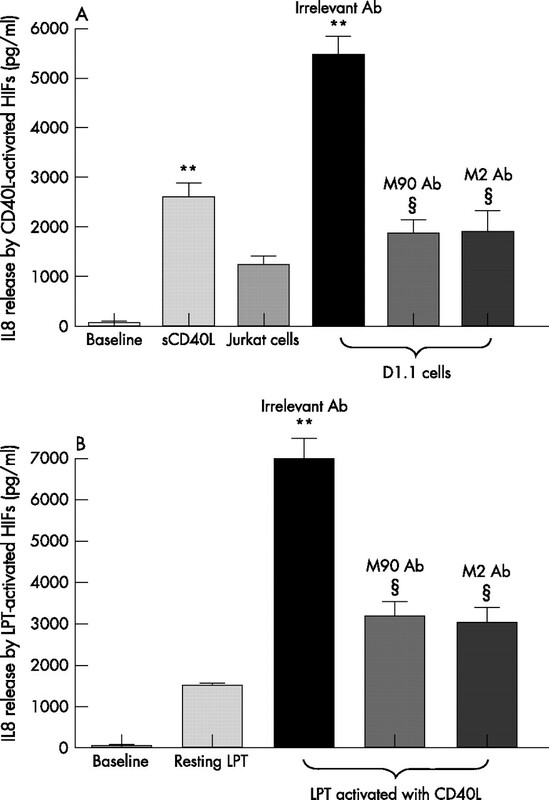 In mice, administration of CD40L antibodies has translated into a clinical benefit for autoimmune and inflammatory conditions, such as collagen-induced arthritis, lung inflammation and fibrosis, experimental allergic encephalomyelitis, lupus nephritis, atherosclerosis and hapten-induced colitis.11 Studies with chimeric antagonistic monoclonal antibodies to CD40L (IDEC-131) have been initiated in CD.25 The administration of IDEC-131 to patients with refractory immune thrombocytopenic purpura has been associated with mild adverse events but not with infections or thromboembolic events,38 suggesting that this treatment modality might be safe and well tolerated in patients with IBD. Our study also suggests that activated LPT cells bearing CD40L as a consequence of mucosal inflammation might trigger HIF activation and angiogenic cytokine release. Such soluble mediators might, in turn, activate HIMEC angiogenesis. In addition, sCD40L fosters directly mucosal angiogenesis, pointing to a dual mechanism responsible for CD40-dependent angiogenesis in the inflamed gut. Our studies indicate that therapeutic inhibition of the CD40–CD40L pathway can impact both on nonimmune cell activation and on inflammation-driven angiogenesis in IBD. The authors are indebted to Mario P. Colombo (Immunotherapy and Gene Therapy Unit, Istituto Nazionale Tumori, Milan, Italy) for providing CD40KO and CD40LKO mice. The authors wish to thank Mr. Renato Zocchi for figure editing. The authors’ studies were supported by grants from the Broad Medical Research Program and by Associazione Italiana per la Ricerca sul Cancro (AIRC) grant (to SD). Folkman J. Seminars in Medicine of the Beth Israel Hospital, Boston. Clinical applications of research on angiogenesis. N Engl J Med1995;333:1757–63. Leung D W, Cachianes G, Kuang W J, et al. Vascular endothelial growth factor is a secreted angiogenic mitogen. Science1989;246:1306–9. Rutella S, Bonanno G, Procoli A, et al. Hepatocyte growth factor favors monocyte differentiation into regulatory interleukin (IL)-10++IL-12low/neg accessory cells with dendritic-cell features. Blood2006;108:218–27. Jiang W G, Martin T A, Parr C, et al. Hepatocyte growth factor, its receptor, and their potential value in cancer therapies. Crit Rev Oncol Hematol2005;53:35–69. Mazzucchelli L, Hauser C, Zgraggen K, et al. Expression of interleukin-8 gene in inflammatory bowel disease is related to the histological grade of active inflammation. Am J Pathol1994;144:997–1007. Heidemann J, Ogawa H, Dwinell M B, et al. Angiogenic effects of interleukin 8 (CXCL8) in human intestinal microvascular endothelial cells are mediated by CXCR2. J Biol Chem2003;278:8508–15. Utgaard J O, Jahnsen F L, Bakka A, et al. Rapid secretion of prestored interleukin 8 from Weibel-Palade bodies of microvascular endothelial cells. J Exp Med1998;188:1751–6. Koutroubakis I E, Tsiolakidou G, Karmiris K, et al. Role of angiogenesis in inflammatory bowel disease. Inflamm Bowel Dis2006;12:515–23. Polverini P J, Cotran P S, Gimbrone M AJr, et al. Activated macrophages induce vascular proliferation. Nature1977;269:804–6. Auerbach R, Sidky Y A. Nature of the stimulus leading to lymphocyte-induced angiogenesis. J Immunol1979;123:751–4. Danese S, Sans M, Fiocchi C. The CD40/CD40L costimulatory pathway in inflammatory bowel disease. Gut2004;53:1035–43. Vogel J D, West G A, Danese S, et al. CD40-mediated immune-nonimmune cell interactions induce mucosal fibroblast chemokines leading to T-cell transmigration. Gastroenterology2004;126:63–80. Ferrara N. VEGF: an update on biological and therapeutic aspects. Curr Opin Biotechnol2000;11:617–24. Melter M, Reinders M E, Sho M, et al. Ligation of CD40 induces the expression of vascular endothelial growth factor by endothelial cells and monocytes and promotes angiogenesis in vivo. Blood2000;96:3801–8. Danese S, Fiocchi C. Platelet activation and the CD40/CD40 ligand pathway: mechanisms and implications for human disease. Crit Rev Immunol2005;25:103–21. Rutella S, Danese S, Leone G. Tolerogenic dendritic cells: Cytokine modulation comes of age. Blood2006;108:1435–40. Lederman S, Yellin M J, Krichevsky A, et al. Identification of a novel surface protein on activated CD4+ T cells that induces contact-dependent B cell differentiation (help). J Exp Med1992;175:1091–101. Danese S, Katz J A, Saibeni S, et al. Activated platelets are the source of elevated levels of soluble CD40 ligand in the circulation of inflammatory bowel disease patients. Gut2003;52:1435–41. Reinders M E, Sho M, Robertson S W, et al. Proangiogenic function of CD40 ligand-CD40 interactions. J Immunol2003;171:1534–41. Larsen C P, Elwood E T, Alexander D Z, et al. Long-term acceptance of skin and cardiac allografts after blocking CD40 and CD28 pathways. Nature1996;381:434–8. Schonbeck U, Sukhova G K, Shimizu K, et al. Inhibition of CD40 signaling limits evolution of established atherosclerosis in mice. Proc Natl Acad Sci USA2000;97:7458–63. Stuber E, Strober W, Neurath M. Blocking the CD40L–CD40 interaction in vivo specifically prevents the priming of T helper 1 cells through the inhibition of interleukin 12 secretion. J Exp Med1996;183:693–8. Danese S, Sans M, Gasbarrini A. CD40 antisense based strategy for inflammatory bowel disease: shutting down multiple cellular communication systems. Gut2005;54:891–2. Maerten P, Liu Z, Ceuppens J L. Targeting of costimulatory molecules as a therapeutic approach in inflammatory bowel disease. BioDrugs2003;17:395–411. Dumont F J. IDEC-131. IDEC/Eisai. Curr Opin Investig Drugs2002;3:725–34. Fiocchi C, Battisto J R, Farmer R G. Gut mucosal lymphocytes in inflammatory bowel disease: isolation and preliminary functional characterization. Dig Dis Sci1979;24:705–17. Danese S, de la Motte C, Reyes B M, et al. Cutting edge: T cells trigger CD40-dependent platelet activation and granular RANTES release: a novel pathway for immune response amplification. J Immunol2004;172:2011–5. Danese S, Sans M, de la Motte C, et al. Angiogenesis as a novel component of inflammatory bowel disease pathogenesis. Gastroenterology2006;130:2060–73. Vermeulen P B, Gasparini G, Fox S B, et al. Quantification of angiogenesis in solid human tumours: an international consensus on the methodology and criteria of evaluation. Eur J Cancer1996;32A:2474–84. Guiducci C, Valzasina B, Dislich H, et al. CD40/CD40L interaction regulates CD4+CD25+ Treg homeostasis through dendritic cell-produced IL-2. Eur J Immunol2005;35:557–67. Obermeier F, Dunger N, Strauch U G, et al. CpG motifs of bacterial DNA essentially contribute to the perpetuation of chronic intestinal inflammation. Gastroenterology2005;129:913–27. Spencer D M, Veldman G M, Banerjee S, et al. Distinct inflammatory mechanisms mediate early versus late colitis in mice. Gastroenterology2002;122:94–105. Krieglstein C F, Cerwinka W H, Sprague A G, et al. Collagen-binding integrin alpha1beta1 regulates intestinal inflammation in experimental colitis. J Clin Invest2002;110:1773–82. Barbe-Tuana F M, Klein D, Ichii H, et al. CD40–CD40 ligand interaction activates proinflammatory pathways in pancreatic islets. Diabetes2006;55:2437–45. Cagnoni F, Oddera S, Giron-Michel J, et al. CD40 on adult human airway epithelial cells: expression and proinflammatory effects. J Immunol2004;172:3205–14. Flaxenburg J A, Melter M, Lapchak P H, et al. The CD40-induced signaling pathway in endothelial cells resulting in the overexpression of vascular endothelial growth factor involves Ras and phosphatidylinositol 3-kinase. J Immunol2004;172:7503–9. Cho C S, Cho M L, Min S Y, et al. CD40 engagement on synovial fibroblast up-regulates production of vascular endothelial growth factor. J Immunol2000;164:5055–61. Kuwana M, Nomura S, Fujimura K, et al. Effect of a single injection of humanized anti-CD154 monoclonal antibody on the platelet-specific autoimmune response in patients with immune thrombocytopenic purpura. Blood2004;103:1229–36. Competing interest statement: None declared.